The address book objects are organized on the page into four tabs: Mailboxes, Public folders, Groups and Servers. Read more about public folders in this chapter. The Create contentWEB access columns indicates if there is a command for the provisioning job to create contentWEB users for the selected object (mailbox, group or server). 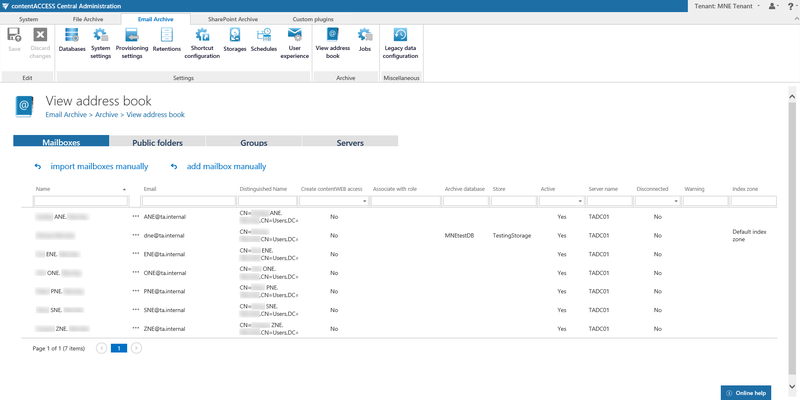 Once a contentWEB access is granted (provisioning job must be run), every user of the provisioned object will be able to access the archived content of the mailboxes, which he is able to access also on the Exchange server. The Associate with role column displays the role assigned/to be assigned for the Exchange object by the next running Email provisioning job. By default, the Exchange server mailboxes inherit the default role specified in the Email archive Provisioning settings, but the administrator can decide to assign custom roles for the objects. Such custom roles can be selected, when contentWEB user is created for the Exchange object (more information here). Column “Active” shows, if the respective mailbox or group is active in contentACCESS. With this feature it is possible to deactivate no longer used mailboxes, keeping the licenses under control. 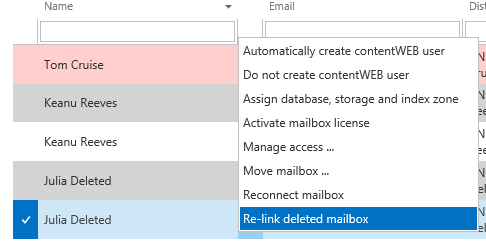 Deactivated mailboxes/groups are neither touched by the Email archive/Email restore, Email recovery and/or by the Shortcut synchronization jobs, nor they are counted to the licensed mailboxes. To set a group or mailbox to active/inactive, the telemetry job must be run, too. It is running automatically every day or can be started manually on the Licensing page (System tab => Services group => Licensing, option “update telemetry”). Please note that you can’t have more active mailboxes than the license allows. If you have already reached the limit, it won’t be possible to add more mailboxes for archiving. Note: The mailbox is ready for archiving if it’s associated with a database and storage and is set as active. If license allows it, the mailbox will be archived. After reaching the limit of active mailboxes of the license it won’t be possible to archive more mailboxes. Important: If the limit was already reached, the existing email jobs are not able to start. In order to fix the problem, it is necessary to deactivate some mailboxes until the number of active mailboxes drops under the number of licensed mailboxes and then run the telemetry job. The email archive database, storage and index zone assigned/to be assigned to the Exchange mailbox(es) are displayed in the Archive database, Store and Index zone columns. 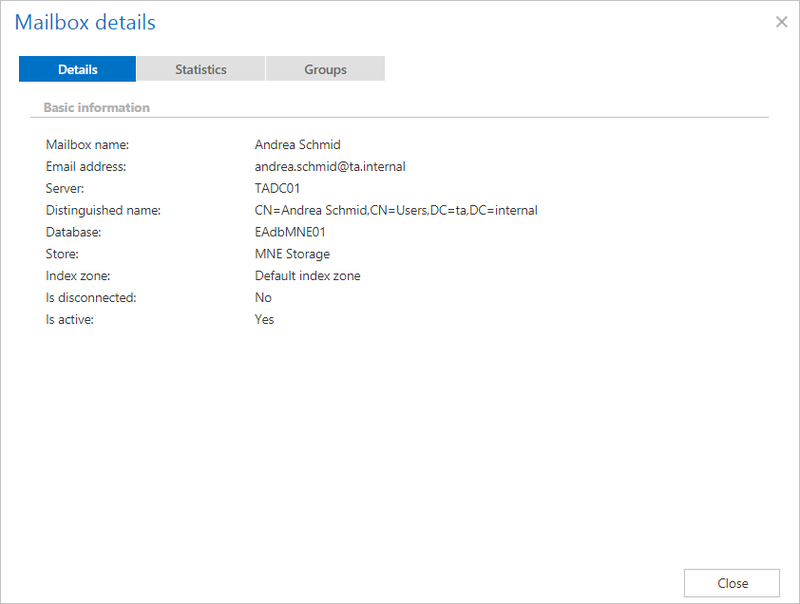 Database and storage is assigned automatically either by the provisioning job or by the first running archive job, or manually using the mailbox context menu. Index zone can be assigned by the provisioning job or archive job, not manually. The Process as journal column shows if the mailbox will be processed as journal when selected in Address books objects to process in email archive job configuration (read more here). Here it is possible to see the mailbox details, archive statistics and the list of groups of the user. You should only use the Disconnect mailbox option if the mailbox no longer exists and you want to re-use the email address for a new user/mailbox. By disconnecting the mailbox, the email address will be changed – allowing to use the email address for a new user. After you disconnect a mailbox, the email address is prefixed with #. If the mailbox was not re-used yet, you can undo the operation and Reconnect the mailbox. If the mailbox is marked with the warning Guid changed (read at the end of this section), a new menu option (Re-link deleted mailbox) appears. By using this option it is possible to locate the new mailbox, which was created for the user. Based on the status of the mailbox, different context menu is displayed.